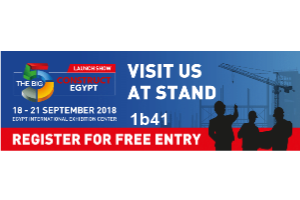 The exhibition “Big 5 Construct Egypt”, which will take place from 18-21 September 2018 in Egypt, will be attended by Lamda Leventis S.A.
Lamda, which specializes in shading space since 1967, will have its own stand at the International Exhibition Center of Egypt. Lamda is actively present at a leading international manufacturing exhibition that will bring together decision makers, innovators and suppliers from and beyond the region for four days of business and networking opportunities. Visit Lamda at stand 1b41.